Sleepwalk (Chris Benker, 2015, run time 20 minutes) examines the loss of our cultural memory through the creation and dissemination of false images. As the loss of memory on a personal level is a symptom of dementia, the appropriation of our collective memory (for largely economic reasons) equally signifies the sickness of our culture. As American society continues to serve the needs of the military industrial complex, images of wars (past and present) deserve special scrutiny and analysis. The battles of our daily lives are fought with images. And the images we choose to create and consume define who we are as both individuals and as a society. 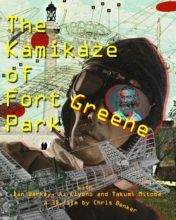 The Kamikaze of Fort Greene Park (Chris Benker, 2018, run time 20 minutes. Anaglyph 3D) follows the ghosts of Walt Whitman (AKA “The Poet of American Democracy”) and a Japanese Kamikaze pilot as they drive through a Brooklyn night. Unable to understand each other, the pilot laments the tragedy of his short life, as the poet reads verses glorifying battles of the American Revolution. The robot – Tokio Roze, broadcasts poetic propaganda as incarcerated terror suspects fantasize of having the freedom to dance. An experimental 3D meditation on our culture of aggression, the film stresses empathy as our only hope for a peaceful future. The screenings will be preceded by a short poetry reading by Jerome Mazzaro. Jerome Mazzaro is an accomplished poet and critic. He was awarded a Guggenheim Fellowship in 1964 and has taught at The University of Detroit, SUNY Buffalo, Bennington College and San Diego State College.